← Amnesty International Annual Report 2013 on Turkey: Ten Major Issues Highlighted. That is, without question, something that Turkey can be proud of. But, like many surprising statistics, there is more here than meets the eye. And, despite the country’s large number of successful professional women, the broader picture of gender equality is, in fact, extremely troubling.With regard to the prominent role that women play in Turkish academics, it is significant, but more complicated than the numbers suggest. As in the United States, academics is one of the rare professions that offers flexible schedules that facilitate juggling parenting responsibilities and a professional life. Yet, scholarship has shown the feminization of the profession is often accompanied by decreased social status and relatively low pay (elementary school teaching in the United States is the classic example of this). In Turkey, outside of elite private universities, academic salaries generally fit this model. Moreover, female academics in Turkey make significantly less, on average, than their male counterparts with similar experience. 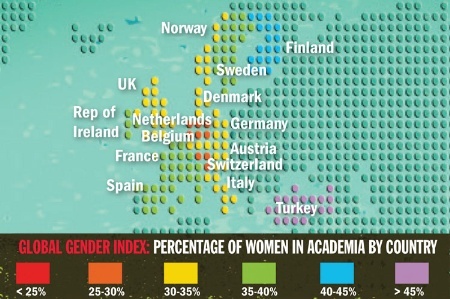 In short, the high number of women in Turkish academia is something to be proud of. But it doesn’t demonstrate that Turkey is a bastion of gender equality. In fact, the broader picture is deeply troubling. The World Economic Forum’s Global Gender Gap ranks Turkey a dismal 124 out of 135 countries, a shade ahead of Egypt, Iran, and Mali, but behind the United Arab Emirates, Jordan, and Kuwait. As Andrew Finkel notes in a recent blog, religious women have had a particularly difficult time finding their way into the workforce. The AK government has had a mixed record on women’s issues. Turkey took some important steps on women’s safety this past year, by “[ratifying] the Council of Europe Convention on preventing and combating violence against women and domestic violence, and [passing] a law which strengthened protections and allowed for the direct application of the Convention.” However, in a country of more than seventy million people, there are only 103 shelters for survivors of domestic violence. This statistic is far below the number required by domestic law and far below the dramatic need in a country where domestic violence is both commonplace and commonly accepted. Moreover, the AK government has sent disturbing signals regarding reproductive rights. The Turkish Prime Minister has described abortion as “murder” and called for greater restrictions on it. (See here for Jenny White’s brilliant dissection of AK rhetoric on this issue). Prime Minister Erdoğan has, part of his emphasis on “family values,” repeatedly called for “at least three children are necessary in each family.” He has argued that Turkey’s economic future is dependent on it. For a historian such as myself, this emphasis on child-bearing as a primary responsibility of the “national woman” brings forth disturbing echoes of an early twentieth century nationalism. Regardless, it leaves one with little optimism that Turkey will take the fundamental steps needed to address its egregious gender gap any time soon. This entry was posted in Turkey, Women's Rights and tagged Abortion Rights, Academia, Erdogan, Gender, Gender Gap, Shelters, Turkey, world economic forum. Bookmark the permalink.